The beautiful ANS Katai SG is a custom-made wooden pedicure spa that features a stunning square glass sink bowl and sophisticated Zen style. Impress your customers with the classy looks and graceful elegance of this luxurious pedicure spa. 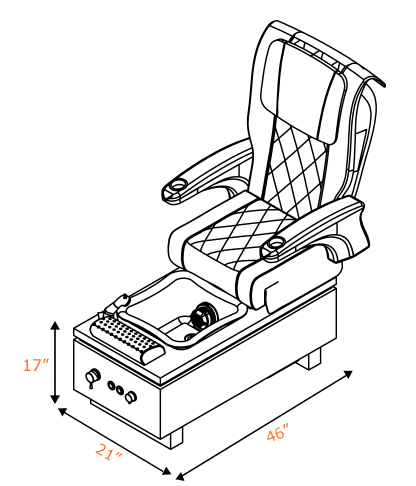 The ANS Katai SG also includes a premium massage chair of your choice. The ANS Katai SG is custom-made and custom-built with your choice of custom wood-laminate colors. The ANS Katai SG includes a sohpisiticated square glass bowl. Accent panels are installed on the sides of each spa and are an additional $100. The ANS Katai SG is a beautiful wooden pedicure spa that features a luxurious square glass sink bowl. This elegant pedicure spa is custom-made and built-to-order with your choice of wood laminate color. Each ANS Katai SG is handcrafted by our expert carpenters according your specifications and details. For quality assurance, each spa is designed and assembled here in the USA. For convenience, the ANS Katai SG has a emovable back panel for easy access to the interior of the pedicure spa. Each pedicure spa also comes equipped with a powerful ANS Liner Jet that provides the soothing whirlpool effect that customes love. The ANS Katai SG features a beautiful square glass sink bowl; an adjustable footrest; front-mounted faucet; multifunction shower head; an embedded LED light color therapy; free matching pedicure stool. The ANS Katai SG features the new ANS P20 Massage Chair. The ANS P20 is Alfalfa Nail Supply's 20th anniversary massage chair and is loaded with special features and functions. This innovative massage chair is made with soft PU leather and comes in the color of your choice.